console.log will show you the entire model inside the F12 Developer Tools console so you can pick what you need. If you would like to allow a user that filled out a form to edit their own entry at a later date without giving users access to edit all entries from all users, you can do this with a form that loads the data in the pre init. You should filter the select query with a token: select ‘whatever’ from yourtable where userid=[User:UserId]. Say you have 2 Action Form instances on a page and you would like to execute a button on Form 1 by clicking a button on Form 2. The easiest way to do it would be via jQuery. Alternatively, you can use DNN API Endpoint to build web services and call this via AJAX in the OnChange/Click binding. 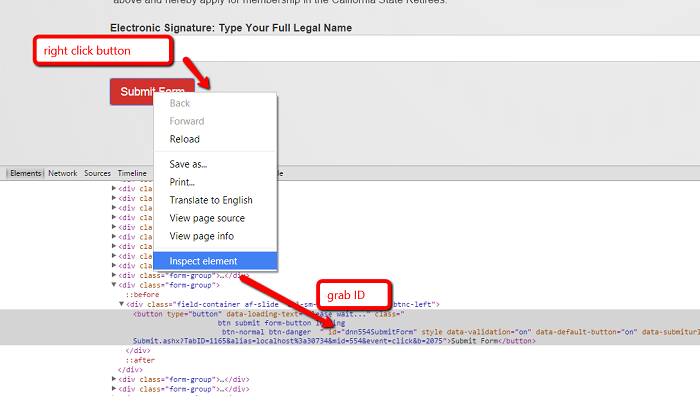 To call the button ID of the other form via jQuery, you can use the Inspector from F12 Developer Tools to identify the button and grab its ID. Add a Multiple Choice (with Checkboxes) field with name Checkboxes and Items: item1, item2, item3, item4, item5 Add a TextBox field, named Testx to properly work. Many of you may have already hit a brick wall when trying to update a Username in DNN. It is almost taboo to talk about. This is because DNN uses the Username to connect to ASP.Net’s core tables for login credentials. The username is stored in various places throughout your website’s database, so it is not as simple as one would think. However, with a program as cool as Action Form and a little knowledge of DNN we can overcome this. First we need a form to collect and validate the Username & Password. This form will be used for whoever is currently logged in and would like to change their login credentials. So its purpose is to let your users manage their own login info. ConfirmPassword (Type: Password). Click on the required field check box, and select the validation to be ‘No White Space’. *** Set the ‘Confirmation Of ’ dropdown to Password to set up the automatic compare validator. Now create a Button to Submit the Form. Now the fun begins. We need to create a few Actions to update Username & Passwords. First add an ‘Update User Profile Action’. Click the ‘Allow Password Update’ checkbox to tell the action to update the password. Next (here comes the stuff) add a ’Run SQL Query’ Action. Add the code listed at the bottom of this article into the ‘SQL Query’ box. Because we just changed the Username internally inside DNN we must now add a ‘User Login’ Action. This will magically reload the User with the new Username & Password. *** Without this action, the User will be automatically logged out, but the changes have been made and they would log back in with new credentials. I found that this action prevents that. The last action I use is purely optional. Once the above actions have run, I added a ‘Redirect To Portal Page’ action and redirected to the Home Page. You can redirect anywhere you please, or fire other actions that may be relevant to you. So this is where it ends and works great for our clients. Just one simple disclaimer, I typed all this code in and could have possibly fat fingered or stumbled on the keyboard. Please look over my SQL Code for any obvious dumb errors. Also please test all this in a testing environment first. When changing Usernames & Passwords you run a risk of preventing someone from logging in. ** For those of you who want to know a little more. DNN uses ASP.Net’s standard method for authenticating Users. The Username (NOT THE USERID) is the column used to connect DNN’s User table to the ASP’s Aspnet_Users table. The Apsnet_Users Table stores the Username in two different columns. One is untouched and the other is converted to lowercase. I store all usernames in lowercase just to be consistent throughout all the tables. Should you ever be in SQL Server Management Studio and making changes to the Username, must make sure you change the Username in the Users table, and the UserName in the Aspnet_Users and they must match identically in case. This is why always make sure all my Usernames are converted to lowercase. Looking for a quick and easy way to add some personality to your DNN form? Well, the astute among you will have noticed that Action Form can be styled with standard CSS. But we’ve had a lot of Action Form users still asking how to customize their forms. We understand that not everyone is comfortable with coding, but don’t worry, this won’t hurt a bit. We’ve prepared a video tutorial that will guide you through the process of customize Action Form using CSS styles and CSS classes. You’ll see that it’s easy to customize your forms. It’s like…Boom! And you’re done! In just few steps you’ll bask in the glory of your new form! Hopefully this post inspires you to take your Action Form to the next level in a way that is easy and enjoyable for your visitor to experience. With the ability to use CSS styles and CSS classes, you can now make Action Form fit that much better with your DNN portal than you could ever before. And this is great for converting visitors into revenue. Getting a visitor to provide you with their information is a key step in any conversion funnel. That’s why adding a custom form to your DNN portal is an easy and smart way to drive conversions while reducing funnel abandonment and lost revenue. Franchisee: When they log in to website the form should automatically populate the fields in the form and is the one which will be using the form more often to submit info. Also, each franchisee will have their own list of clients which will automatically get populated as well in let’s say a dropdown field once the franchisee logs in to the website. The submission done by the franchisee will be converted into a pdf (invoice) and the copies will be sent to multiple emails(mostly the client and the admin). Admin: Will generate reports based on a franchisee which s/he chooses from the list. The first thing is you’ll need to design your database architecture independently of Action Form. Next, you’ll build forms that use SQL actions to load and put data into your application tables. We have an add-on for generating PDFs and also a Grid module which you might need to populate data. First you have to add a Multiple choice field in the form where you determine the Items the user will select from, then simply add a text box field where you can add the [YourCheckboxFieldId] in the Show Binding box. Say you have a custom profile field called BirthMonth and one called BirthDay and you need to display DisplayName, BirthMonth and BirthDay, where BirthMonth = this month and BirthDay = today. Click Next, and in the Property Name field write BirthMonth: . Then scroll down to Bind Expressions, and in the Show field write [Profile:BirthDay] == [DateTime:Now|dd] && [Profile:BirthMonth] == [DateTime:Now|MM]. This way, when these conditions are met, the field will be shown and populated with the respective values. When UserAccount-A is logged-in he can view other users that have RoleA and the same for UserAccount-B but they should not be able to view users that are not in the same role than them. Also using the action-form for data entry is it possible to Add/Delete User Accounts. Not being a member of the “Administrators” role. For Anyone else in the community needing help with a similar project I’ve outlined the spec’s below if it’s something you need and are not 100% knowledgeable of TSQL you can adapt the following queries to suit your needs and if anyone needs clarification please do not hesitate to reach out to me or Jerry I will do the best I can to explain. I needed a Grid displaying user accounts only with a matching identifier of the “currently logged-in” user. For this I created a CompanyID property through DNN’s profile properties section. Then I build a form using ActionForm that would allow a logged-in user to create a new account and have THEIR CompanyID along with some other useful information such as (department, codes, etc…) directly to the profile of the new user account. From this point we would now have 2 accounts with the same CompanyID. Then i used a ActionGrid with the following queries to return users with the same CompanyID & not return the logged-in user themselves as we wanted to limit user error and not give them the option to delete themselves from the grid interface. Hope this helps someone who might not know SQL very well off course it seems mostly everyone on here knows SQL pretty in depth and I apologize for the redundancies of my posts I am still a beginner and hoping to help anyone else that might be in the same shoes than myself. If you want to add a Date picker field using an Action Form and you want to display the system time, you can use a DNN token without the need of installing the My Tokens module. Therefore, go to the manage form page and after you select the Date and Time field add in the Initially Checked box the following token: [DateTime:Now]. If you would like to export all rows in the SQL query data source (not just those that are displayed and selected on the grid) you can do it by deselecting all of the options for the device specific display, so the fields will not display but they will serialize and export. There are several ways to align the Label in Action Form, but what if you wanted to hide it altogether? This can be achieved by writing display:none;border-top:0px; in the Label Styles field. To implement an action in Action Form, you have to either implement interface avt.ActionForm.Core.Actions.IAction from avt.ActionForm.Core.dll or DnnSharp.Common.Actions.IActionImpl from DnnSharp.Common.dll. You can also place your code in the General > Initialization Script. Do a console.log(form) to see the entire module in the F12 Developer tools. You’ll also have access the the control IDs. This will log off the user and then redirect to the page you have designated in the DNN admin. I want to grab the Text not the value of a Department dropbdown control. If I use DepartmentText = [Department] it returns the value of the dropdown. If I try DepartmentText = [Department:Value] or DepartmentText = [Department:Text] it returns blank for both. this will give the text box the value of the dropdown. Don’t forget to replace mytextbox and dropdown with their respective IDs. If you have an initial value on the dropdown, then you will have to use the code in General Settings > Initialization Scripts as well. If you encounter problems when using checkboxes, you can use bootstrap classes in the Control CSS Classes field. Enter col-sm-2 or col-sm-3 or col-sm-4 and you will get responsive columns. Add 2 fields, a Multiple Choice(with Dropdown) field, with Items item1, item2, other and a TextBox field with name Other. In Other field in Bind Expressions, at the show option add this syntax [DropDownId] == “other” . For each field please check the “Required” option. First you have to add a Title type of field on the form and in the Label Title use the HTML tag to specify that you want the text to be bold. If you’re trying to implement validation as the user types, you can write $(this).valid(); in the On Change field under bindings for a textbox for example. In General Settings, Display mode, select the Pop-up option. Click on Edit Template and add your message and set the width using the Popup Width option. Note that it’s not feasible for us to ensure compatibility between our product and 3rd party Skins, because we’re always releasing new builds and so do they. But doing so breaks the navigation on mobile devices making the menu not clickable to drop and show additional pages. This is the CSS to fix that. When adding the following syntax ?yourdropdownid=item1 in your URL, the Dropdown field is completed with item1 value. On the first action Form use a Redirect to Portal Page action in which to send the value of ConditionID, through QueryString, to the second Action Form that will be open in a PopUp; choose -PopUp- as display mode from General Settings. then save and get back to the form to see if the user records from the database table are displayed according to our Select statement. Where you change the [TextBox] token to the name of your field. A user has more profile properties, in order to create a new one, just access the Site Setting option from the Admin menu > click on User Account Setting > Profile Settings > click on Add New Profile Property button - and create the property that you want to be added on the next user profiles which will be created, let’s say Birth Month. In order to populate the new property, you can create a Registration form where it’s mandatory to add the field with the property’s title (Birth Month) you want to populate and to leave the Update User Profile action button as it is. In this way, when a user will register and will fill in the profile properties set on the form, they will be automatically populated on the user’s profile page. I have an Action Form that uploads a file to AWS. I want to be able to provide a download link in my associated Action Grid for the file that gets uploaded. This path takes me to the file correctly. How can I have that same path referenced in my associated Action Grid? On Action Form Submit use a Inject Form data action in which insert the [SingleFileUpload:AbsoluteUrl] value in a token; that can be the token name of a Hidden Field so on submit the Absolute Url will be inserted in the hidden field. When you configure the action grid you can create a Template Field with [HiddenField] as link for a href tag. In order to remove the uploaded files, click on Change, and the respective folders containing the files and the files themselves will be highlighted - click on each of them again to deselect, and Update when done. Add a Country and Hidden fields. For each field check the Save to Reports option. In a Submit button, add the Inject From Data action, in which to inject in Hidden field this syntax [Country:CountryName]. If the user is logged on the site and you want to use the information from the user’s profile to be fetched in the form’s fields, you can set on each corresponding field a token like [Profile:FirstName] or [Profile:Email] in the Initial Value field. 3) Get back on the page and select from the picker a Start Date. You’ll see that in the End Date field the date will automatically be calculated as StartDate + 30days. You can do this by using a [SessionOrInit:UID=[Guid:New]]. This will generate a new guid and store it in session if not already there. More info at my-tokens.dnnsharp.com/tokens/core. when I access the URL like www.example.com/formpage?ID=Stockholm, then the text box which matched this condition is displayed on the form, the same applies for the other text box. In version 2 we switched to Boostrap. This means that if you use a Bootstrap 3 skin, the form will pick up the skin appearance, so it looks consistent with the rest of the website. It also means that you can create custom design by overriding standard Bootstrap CSS classes. You can also use the form fields CSS styles property to create custom design or CSS classes property to link it to your CSS classes. Finally, there’s a piece of legacy jQuery UI that is used by the jQuery Datepicker control. But that will also be replaced soon with a Bootstrap control, and at that point we’ll remove jQuery UI inclusion from the form. It will still be able to include it through custom controls though. In Action Form there are many times when we need to have one dropdown change based on the selection of a previous dropdown. Action Form has a very easy way to do this and is described in Bogdan’s video. In his video he will show you how to enter the values (Hard Coded) into each dropdown and connect them together. Works perfect until the day comes you want these dropdowns to be dynamic and loaded from a SQL Server select statement. Today I am going to teach you that it is not only possible but very easy to tie two dynamically created dropdowns via SQL that depend on each other for what values will appear. Let continue to use Bogdan’s example of Car Brands and Models illustrated in his video. (Please if you have not watched this video, now would be a great time). *** This is the standard syntax Action Form uses to load a Text and value to a dropdown. There is no need for any varchar conversions or adding the ‘ ’ to separate the Text from the Value. The next dropdown Models will be based on the value of this dropdown and is where the magic happens. We are simply going to emulate what Bogdan hard codes in his video with a SQL Select that looks like this. Let’s take a look at the query. But first let’s remind ourselves of the syntax Action form requires. We must place the value of the selected item from the Brands dropdown in front of a forward slash. Then the text we wish to display (Models). Next we use a pipe to separate what is shown in the dropdown, from the actual value of the dropdown. I simply built a string to do exactly that. I first convert the BID to varchar so I can concatenate the integer ID to the ‘/’ and text coming from Model name (MName). Next I added the ‘ ’ and the converted MID to varchar. They only thing to note is that deleting all the records from the avtActionForm_Reports table will mean that there will be no records to export from the Action Form reports menu option. But if you are inserting the data into your own tables this should not matter anyways. Create the fields that you want to update with Action Form Module. The Id created field must be the same as the property of User Profile. Add a button with Update User Profile Action. Other properties for User Profile can be created. In General Settings, check the Show Tooltips option. You can select the Show Tooltips option only when Short Description from each field is not empty. The message added in Short Description will be used in Show Tooltips. Start from a blank form template and add a text box field where we want to have a fixed number to which we’ll multiply other numbers to and set in Initial Value box the amount to which we’ll multiply, let’s say 10. Add a second text box where we’ll insert the number we want to multiply to 10 (we’re talking about the previous field). You can also use other basic arithmetical operations like addition, subtraction and division and between the two fields tokens use the signs: + or - or /. If you would like to use Action Form’s GUID as a voucher code, for example, you can employ the following token: [Guid:New] (hyphenated) or [Guid:NewCompact] for the hyphen-free version. However, if you want the code to be shorter, you can use a substring: [String:Substring(Input=[Guid:New], Start=0, Length=6)] for the 6-char version. Keep in mind that you must have My Tokens installed for this to work.